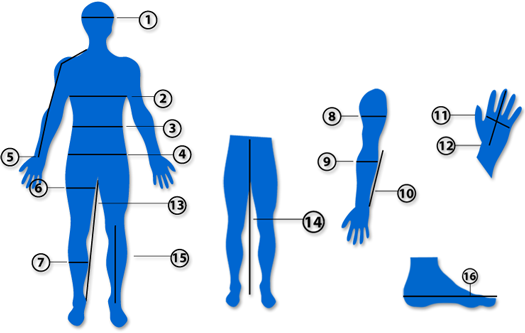 At this page you can find links to size charts of different manufacturers and tips for correct measuring of your body. This will help you finding your required size easily. All you need for measuring is a piece of paper, a pen or a pencil and a measuring tape. Below you can find the exact instructions, where and how you have to measure single parts of your body. Write down the measurements and start shopping clothes that will fit properly no matter which manufacturer's goods you are going to choose. The exact manufacturer's size charts can be found below (Manufacturer Register) or in the "size chart" section of every product. If your measure is right between two sizes, please always choose the larger one. Measure the widest circumference of your head (in the middle of the forehead). Measure the maximum circumference of your chest horizontally around your body. Measure the maximum circumference of your waist horizontally around your body without pulling on the measuring tape. Measure horizontally at the widest part of your buttocks while standing with both feet closed. Measure around your body without pulling on the measuring tape. Measure starting at the base of your neck over your shoulder and slightly bent elbow to your wrist. Measure the maximum circumference of your upper arm while contracting the muscles. Measure the maximum circumference of your forearm while contracting the muscles. Elbow length defines the required size of a forearm protector. Measure the length from just below the elbow up to your wrist. Measure your hand with a tape measure around the knuckles of your hand. Measure your dominant hand - so if you are right handed, measure your right hand and if you are left handed measure your left hand. Measure around your hand without pulling on the measuring tape. Kids' gloves: Measure the length of the hand beginning with the bottom of the palm of hand up to the finger tip of the middle finger. Measure around fullest part of upper leg while standing. Measure around fullest part of lower leg while standing. The length of your shin is important for the size of shin protectors. Place one end of the measuring tape right below the knee cap. Pull the measuring tape down to the top of your shoe. Take out the insole of a perfectly fitting shoe and measure the length of the insole. No insole at hand? Place a piece of paper on the floor and sit down in a chair with your foot resting on the piece of paper. Paint with a pencil around your foot. Measure the lentgh of the foot from the toe to the back of the heal. The length of the insole (or of your foot) in centimeters is the most important data. Please take a look at the manufacturer's size charts to check which size of shoes you require. In our chart example you can find hints, how our manufacturers' size charts work. Please take a look at our measurement instructions above. Determine the size of the selected item (all specifications besides clothing size in cm) and find the best matching column. In line "2: Select..." you'll find the marking which the manufacturers use to describe their products. You can find a register of brands below where we can offer you a particular size chart. Please notice the hints above for measuring your body correctly. If you couldn't find a particular size chart for some brand please use our general size chart to select the approximately correct size. The general size charts are only recommendations, the sizes of most manufacturers may vary. Please determine all the required measurements for the selected product (all specifications besides clothing size in cm) and select the most fitting column. As a second step, please select the matching size shown under the column. How to determine the correct inseam: Measure the right leg from the underside of the crotch (known as the top inseam point) to the bottom side of the ankle (the lowest inseam point).